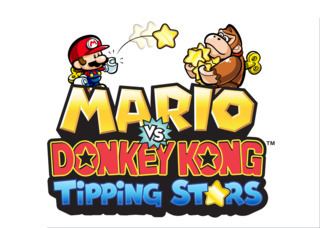 Welcome to the official discussion thread for Mario vs Donkey Kong: Tipping Stars on the 3DS! To start, please add this game to your log, add it to your collection (if applicable), and (when you are ready) rate it using the link above! Did anybody receive the advertisement for this game on their Wii U systems? I certainly did, and I decided to take the plunge. I haven't played a Mario vs. DK "Minis" game since the very first (not counting the original Mario vs. DK) since the theme never really appealed to me. For whatever reason though, I grabbed this and it happens to be one fun piece of entertainment! I tried the Wii U version first, then tried out the 3DS version. Aside from one of the levels in the first world starting slightly differently, the games are identical (minus the resolution of course). The 3DS game doesn't have any 3D either, unless you count the splash screen before you boot up the game. A little quibble though: The games don't share saves, so owning both versions, while nice, is sort of pointless. The main levels are nifty, but once you've bested them there is no fun in doing them all over again. Granted, you can always download community levels on either version, so I guess it doesn't hurt to have both. That said, being Nintendo, I didn't expect them to share saves, but I was hoping to be surprised. Anyway, check it out! It's a neat little game. Nobody? Seriously? Aww, I wanted to try some NW peeps' levels out. I'll jump in on this, just not yet. I'm still finishing off Pokemon Shuffle and other games. I'm looking to get the Wii U version soon. They're basically one and the same, no? Almost exactly. Levels themselves should be totally the same. You get a download code for the other one when you buy a copy anyway. Thinking of sharing that code or using both? Oh wow it's a code, meaning you could split the cost? That seems crazy, I would assume they'd just unlock it on your eShop account so it's linked to your Nintendo ID to prevent you from passing it off to someone else. This seems like exactly the kind of thing Nintendo tries to avoid. I haven't tried it myself but I have heard nothing refuting this. I'm pretty sure you get a code on your game to use but I don't know if it has any understanding of what account it's on. Yep, you can share the code. On a side note: Some of the stages are actually slightly different between the versions. I'm not really sure why, but it's true! One example is stage 1-3. Both are just slightly different. Also, I spent a few hours constructing a stage last night and shared it... Nobody's played it yet. Boooooo. Maybe I'll nab this tomorrow since I just finished Captain Toad. Plus I don't want to leave you hanging! I'm just not sure if I wanna be nice and share my second code with my girlfriend or nephew, or if I'll want this on both systems. They don't sync up at all do they if you have both? No, the saves don't sync, unfortunately. Actually a RFN listener sent us the Wii U code after buying the 3DS version for himself, so you can definitely share it: I got my copy for free. The game is very much standard M&DK fare for now. I loved Minis on the Move for being different, and now this return to form is underwhelming. But I haven't played any user-made stages yet, and that's basically the one unique feature the game has (if you forget the fact that March of the Minis had it). Not to mention Minis March Again! and Mini-Land Mayhem! had that level-sharing feature as well. I'd like to get the Wii U version at some point, but I've got a lot on my plate right now (gaming-wise and otherwise) plus our cash flow isn't exactly great at the moment...so I'll wait. It looks good though. I am shocked that there isn't anything unique about this game besides the tipping stars. I almost feel like they should have held this back and added something more substantial or offered it at a much reduced price. I feel like they jacked it up to $20 just because it's cross-buy. Instead of $10 for each version charge $20 and get both, seems logical in a very illogical sort of way. When they announced this cross-buy thing I was hoping they were testing the waters for making more games compatible across both systems, imagine a Fire Emblem game that you can play on either console or handheld and your save always goes with you, that would be so freaking cool and I hope that's what the future has in store. I suppose I'm not underwhelmed because I skipped most of these games until now. I'm having lots of fun designing levels. As for the "cross-buy" yeah, it makes little sense. I can share my code when I get the game, I have no need for 3DS version. I haven't played one of these games before so it'll be new and fresh to me. Pretty pricey, considering the previous entry! I agree that the cross-buy+double-the-price is a weird combo. But I'll pick it up eventually. Eventually, eventually. It's a quality series, if you ignore the crappy first entry. So there are no new gameplay twists in this entry? Nice stage, ploot! For some reason, it didn't show up the first time I searched for Friend-made stages, though, even though I had already seen the Miiverse post for it. Have you published more stages? Thanks! I feel it might've done a little better if I took a better thumbnail snapshot. Although it is a little sloppy overall. As for more stages, I crafted a couple but haven't published yet. Are you making stages?